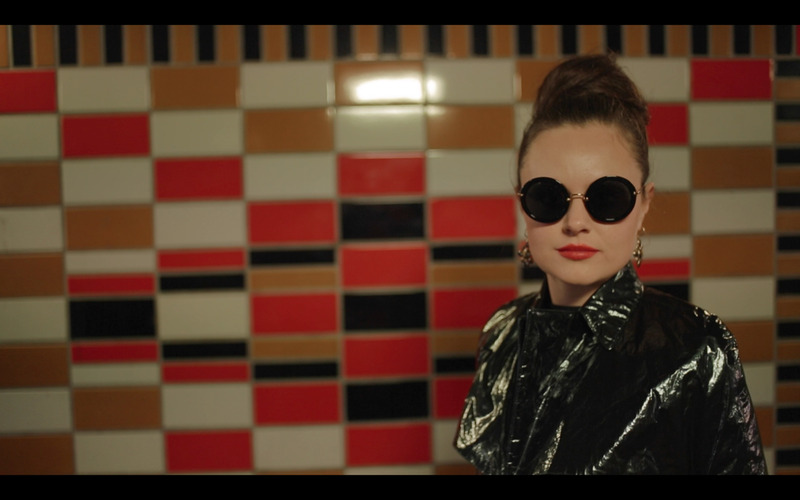 Sophia Carr-Gomm as lead "Georgie" in the Elephant&Castle underpass, wearing a trench from Fyodor Golan AW14. So pleased to say that the filming for the Low Expectations short last week went very smoothly! Our super talented actress playing "Georgie", Sophia Carr-Gomm, was wonderful- as were Maggie Li as "Sarah", Adjani Salmon as "Hot Dealer" and Harry Bird as "Man With Ridiculous Hair" (amusing poster forthcoming). The costumes generously lent by Fyodor Golan look fantastic- combined with the LoVeNeoN "Low Expectations" sign and the fabulous work of our crew, everything looks and sounds great. Could really not have hoped for better. My publishers Quercus want the Book Trailer to come out closer to the Low Expectations release date of July 17th, so I'll keep you posted. But all those who backed us on Kickstarter will get a sneak peak when the final edit is ready, hopefully by the end of May! Thank you, glorious pledgers: Matthew Sheret, Basil Safwat, Ali Hughes, Steve Dowdy, Derrick Grant, Shihan Fey, Amy Beth, Fyodor Podgorny Frydman, Golan Podgorny Frydman, Byron Trerice Jr, Chris Douglas, Anna Barr, Sarah Trerice Dowdy, Katie Gordon, Maggie Li, Deeba Syed, Jane Liloutie, Hanako Whiteway, Isabelle Gill, Seba Bodden, Jim Reinelt, Jack Reinelt, Jon Thiel, Jeffrey Lassaline, Cliodhnagh Conlon, Olivia Spring and Sacha Otto Mataya! Anna Reinelt (Director), Hana Forrest (Producer), Maximilian von Thüngen-Reichenbach (First AD), Byrony James (Second AD), Mike O'Conner (Camera Op), Lisa Wilk (First AC), Holly Louisa Rose Stratton (Director of Photography), Nathanael Bauer (Gaffa), Rory Rea (Sound), Leila Reinelt (Editor), Alice Howlett (Hair and Makeup) and Hanako Whiteway (Photographer).